Bees swarm inside a giant boxwood near the kitchen door. Hundreds of them. The whole bush hums, as I pass, four golden furry ones zoom out and dive around my face. As soon as the weather warmed, a six foot black snake adopted the front porch for its shady naps. Proprietarily, it coils on a chair, and sometimes slinks behind the cushion, which can be startling if you happen to take a break in late afternoon with a glass of tea and a book. 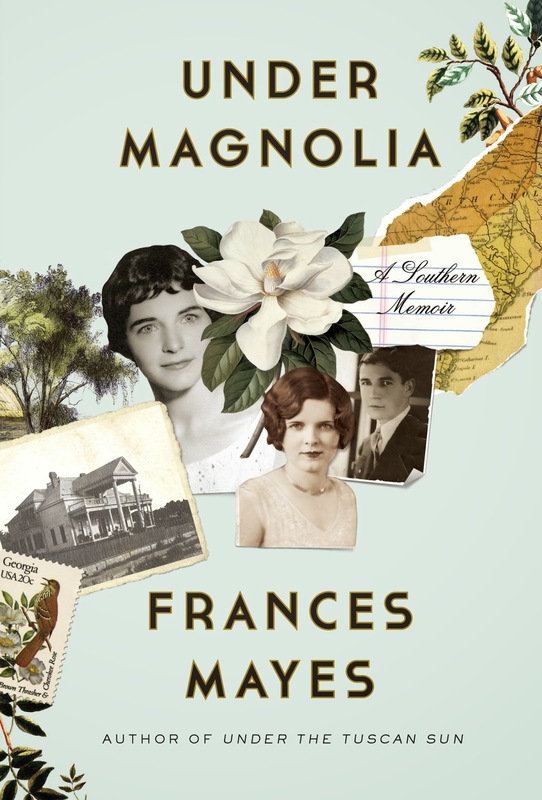 I have read glimpses of Mayes’s South in her other books and I was especially charmed by the long outdoor table to which her father would invite his office workers on hot Friday afternoons. It was always laden with fried chicken, biscuits, peach pickles and assorted mouth-watering cakes. In Under Magnolia, I was prepared to sit back and savor many more of these Southern idylls. I was in for quite a surprise! 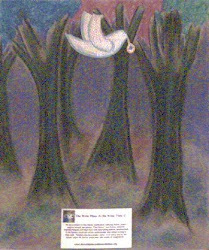 Mayes draws back the curtains and exposes everything it took to create the idyllic scene above. Come taste the heat of a Georgian summer like a shot of Jack Daniels trickling down your insides to warm your belly. This may be her most revealing work yet. We are brought back in time with the familiar prose so beautiful and clear that one can feel the heat, see the thickly running muddy-brown rivers, fear the water moccasins with large black fangs below its depths and try to ignore the crocodiles crawling up the embankments. I want to tuck my feet up on the chair. Indeed, her neighbor’s father used to tease her and her best friend by lifting a gun to his temple; alone one day, he actually pulled the trigger. Another friend came home from school to discover his mother in the kitchen, bullet through her mouth, ginger bread on the counter and teeth stuck in the ceiling. In her own family there was the ranting and raging ‘Big Daddy’, her grandfather, and also her own father’s intense swings of mood. “At his worst my father ripped open his shirt, buttons popping off, and carried his loaded rifle through the house aiming at lamps or windows. ‘Not a one of you appreciates me,’ he shouted.” This was Mayes’s South. If the water moccasins in the rivers where she swam and the bees outside the door don’t get you, the people just might. It was interesting to me that Mayes, who has traveled extensively throughout the world, has come home to the soil of her tumultuous roots. This book explains why she has returned to the flames that forged her. Though it was at times a wild and chaotic environment in which to grow up, it was endemic to that which also nourished her and without which, she might not have become the amazing writer that she is today. It forced her to find solace in books and she became a voracious reader. She had such constant stimulation raging around her with all those colorful, idiosyncratic characters, that she sometimes hid in a laundry bag. This sensory overload only contributed to her singular education and predisposition toward looking at life in a poetic way. She became contemplative and learned to study, listen to and examine life. In this way, she became a sensualist who could celebrate a shade of green in a synesthetic way so that the reader can almost hear it or taste the color purple and feel its warmth. She travels and explores just as an anthropologist would, renting out houses, living among the people, going to family-owned restaurants which are mere holes-in-the-wall where the owners proudly bring her all manner of bounty. She has taken us to Granada, Spain and we raised a glass to Federico Garcia Lorca. We were there as he put on plays, strummed flamenco guitar under the moon, or recited poetry. “What synesthetic images grew inside of him?” she asked. In this new memoir, we learn of the synesthetic images that grew inside of Frances. If she sacrificed it has been for our gain as the colorful personas that shaped her are what has given us such a deep knowledge of the world. Mayes enjoyed her college years at Randolph–Macon College immensely though they were filled with rules and more rules. This may have knocked the independence out of some but she just found more and more ways to expand. She was creative in her pursuit of freedom, sometimes taking the train alone to Princeton. She cultivated friendships there that lasted a lifetime. “We forgot about pleasing men, there weren’t any.” On weekends though, she and her friends had full dance cards, so to speak, as they were in close proximity to the boys’ colleges. Mayes never walked alone and she was a passionate person sampling all of life until she found what nourished her. She searched for the kind of love she would need in life while enjoying the whole of the journey along the way. It was interesting to read of Frank Mayes, Frances’s first husband, who makes a strong appearance in this book as opposed to Frances’s other books in which his absence makes him prominent in the reader's mind, leaving us to wonder about this figure and the marriage she thought would last forever. Of course then, she wouldn’t have met Ed, who is so right for her in so many ways. I love how Ed is up for anything Frances wants to do in life. He literally and metaphorically helps clear a path for her in all of her pursuits. What the book most importantly leaves you with are pieces of yourself. My own memory was stirred with a bite of this, the warmth of that. A spray of her mother’s French perfume from the house of Guerlain and I was back in the grand department store with the marble staircase where I managed the highly elegant cosmetics department in the once busy city where I grew up. Under Magnolia was a sensory experience that lingered. What a precious gift. I hope that I can meet Mayes someday and say thank you for her words—but probably not on her Southern front porch, where I think back to the six foot snake who occasionally likes to put in an appearance. Will Mayes stay in the South? “I won’t say it’s permanent. My philosophy is stare attento, stay attentive, beware... The most pitiable spirits in Dante’s hell, are those unable to move out of their assigned circle. Stare attento. Always look for the next circle to jump to.” This is a good philosophy in this modern day and age when the only thing that is certain is change.